ESChat meets FirstNet’s and the First Responder Network Authority’s highest levels of credibility in the categories of public safety relevancy, security, data privacy, availability, resiliency and scalability. 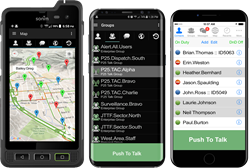 ESChat's secure Push-to-Talk application, is available on FirstNet – the country’s first and only nationwide public safety communications platform dedicated to first responders. FirstNet is bringing powerful tools to first responders to help them stay safe and save lives. ESChat is a great example of that innovation. As a FirstNet Certified app, ESChat meets FirstNet’s and the First Responder Network Authority’s highest levels of credibility in the categories of public safety relevancy, security, data privacy, availability, resiliency and scalability. ESChat is available through the FirstNet App Catalog, to which all and only FirstNet subscribers have access. Its inclusion in the FirstNet App Catalog means first responders using ESChat will be supported by the exclusive benefits of FirstNet service, including First Priority™, which enables priority and preemption. ESChat (http://www.eschat.com) is the leading solution for carrier independent Secure Push to Talk (PTT) over LTE communications. ESChat includes AES-256 encrypted PTT voice and multimedia (text and image) messaging. ESChat also provides live and historical (bread crumb) tracking and mapping. Currently used by the U.S. Military as well as Federal, State and Local law enforcement, ESChat is able to operate over and across any wireless network, including; all commercial carriers, private 3G/4G networks and WiFi. ESChat supports interoperability with all LMR radio networks, including P25 via the native Inter RF Subsystem Interface (ISSI) protocol and DMR via the native Inter Application Interface Specification (AIS) protocol.